Vacation Plans Start as Ideas. Will They End at Your Hotel or Resort? Hospitality marketing is unlike any other type of marketing. Content, design and images must capture the imagination of your visitor and put them at your hotel or resort before they ever step foot on the premises. This is only possible with a digital marketing strategy created specifically for hotels and resorts. Don’t give away prime search engine results page space to other hotels or resorts. Optimize to be the best. 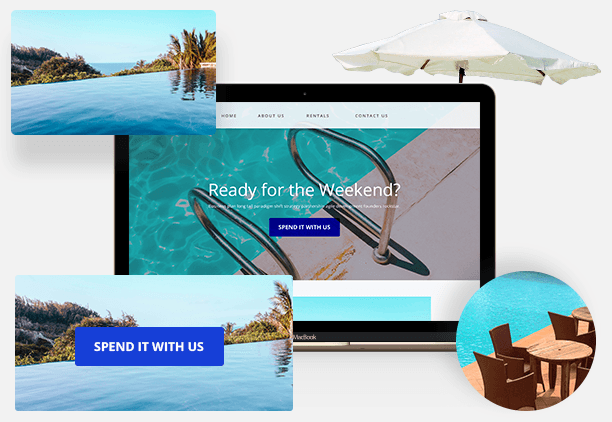 We’ll surpass your website expectations with a awe-inspiring WordPress website built for your hotel or resort. Maximize your marketing budget and supplement your SEO with a search engine marketing strategy for hotels & resorts. Amazing social media profiles that guests will tag in their vacation photos & posts about your resort or hotel! Paint a picture with words about your hotel or resort that not only shows your best side but also attracts web traffic. Finding a hotel or resort has never been easier. There are any number of travel websites or hotel review sites and Google’s local search results can put reviews right in front of your future guests in seconds. In both cases, the path should lead to your website and eventually to your hotel or resort. Are you a beachside resort? Does your hotel or resort provide accommodations for team building functions? Building a keyword strategy around these search queries ensures that anybody searching for what your hotel or resort provides will find your website. Travel plans can start anywhere. Your future guests may be prompted by their Facebook or Instagram feeds to make travel plans. Being the most visible hotel or resort at these moments can be the difference between a successful peak season or barely making it. With a social media strategy designed for hotels and resorts, your piece of paradise can be the hotel of choice. After the vacation, photos are shared on Facebook promoting the vacations of followers. Being tagged in these posts can invaluable and drive traffic to your Facebook page and website. Only a social media strategy designed specifically for hotels and resorts. Publish unique and engaging content on your social media channels – Facebook, Twitter, Instagram and LinkedIn. 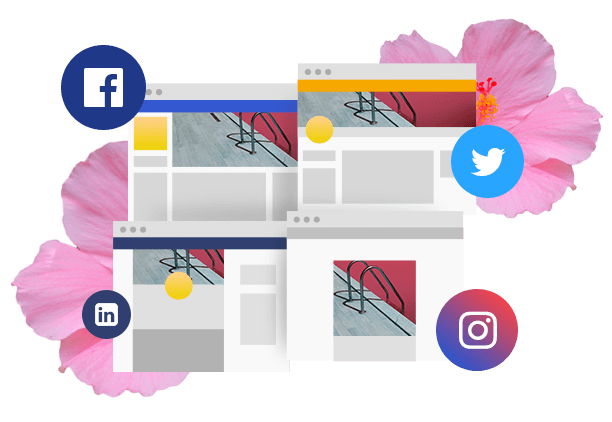 Set up your social media profiles and optimize your brand presence on each platform. Keep track of what people say about your brand, and implement strategies to encourage positive sentiment. Stunning photos and videos, gorgeous design, glowing reviews and updated descriptions of your resort. All of these are characteristics of great web design for hotels and resorts. The experience starts with your website as a reflection of what their vacation will be like. If they see a drab design and dated photos on your website, don’t expect them to click any further. Many hotels have built amazing accommodations on exquisite resorts and never see it realize its full potential season after season. 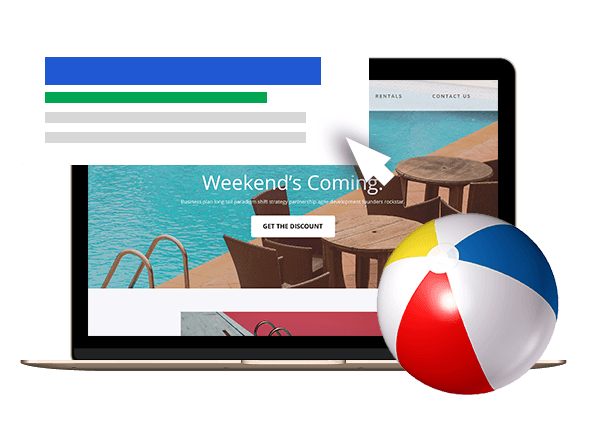 A website can make or break your hotel or resort. Does it have the wrong address? A phone number that your staff doesn’t answer? With so many options for vacationers, great-looking web design and accurate information can be the difference. 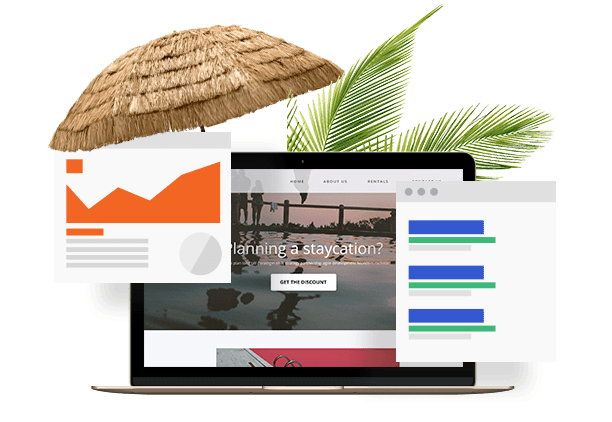 We’ve developed a PPC strategy that has helped our Hotel and Resort clients maximize their search engine marketing campaigns. Goal Setting – Define what the hotel or resort marketing teams want to get out of the PPC campaign and the budget. Keywords – Make strategic bids for keywords that are will bring the right traffic and are the most likely to help meet the goal. Creatives – Great copy and great design are critical for a successful PPC campaign when there is so much competition for attention. ROI – Measure the success of the campaigns in ways that are data-driven and results defined by the goal setting step. Adjust – Make changes to steps 1, 2, and 3 based on the results. Campaigns are fluid and can be adjusted as necessary. Is your hotel or resort your dream investment finally realized? A family property passed down through the generations? Your hotel or resort has a story and a smart digital marketing team will leverage that story to build your personality and fascinate your future guests. 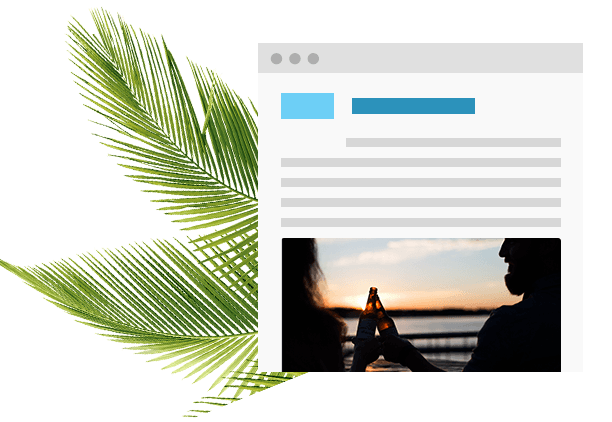 We’ll help you build a content strategy around the goals of your hotel or resort. Are you aiming for a specific audience? Content will be written specifically for that audience. Promoting a special package this summer? The content will focus on the value of the package and encourage readers to book right away! with Our Digital Marketing Services!